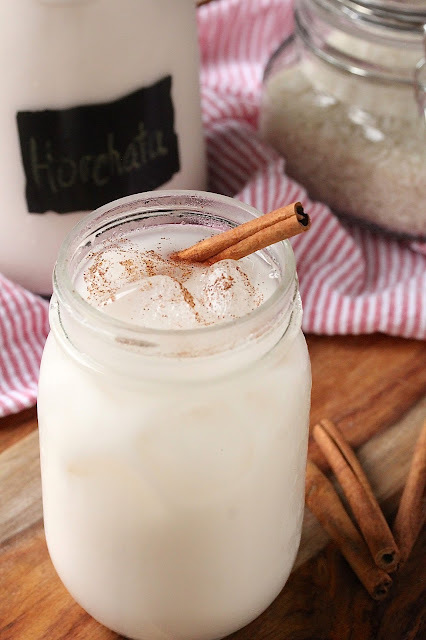 Mexican Horchata is a refreshing and slightly sweetened rice milk drink. This version is delicately flavored with almond coconut milk, vanilla, and cinnamon. It is also dairy and gluten free! If bad things happen in sets of three, then I am due to fall into a drainage hole, get pushed into a swimming pool, or something to that effect any day now. The saga began over a week ago. It was a fine day with no rain in the forecast. I had to run out for a quick errand, and just as I left the house, it started to rain. A minute after I drove off, it poured and poured. The windshield wipers were going a mile a minute all the way to the store. Guess when the downpour stopped? Yep! when I got home. The 20 minutes I was out was the only 20 minutes it rained that day! Humph!! Fast forward four days later. It was beautiful in the morning but turned overcast early afternoon. Since I like shade, it was perfect walking weather. It had been cloudy for an hour, so to be safe, I checked the weather on my handy dandy iPhone. The little pictograms showed clouds but no rain for the next 5 hours. The coast was clear, right? I stayed in. Wasn't up for a do-over. So, I'm waiting for the next shoe to drop or bucket of water to fall. If it does, I'll be sure to capture it on my Instagram for your amusement 'cause I'm a giver like that (hee hee). Oh! Happy belated Cinco de Mayo!! My bad as a food blogger for showing up late to the party, but better late than never!! I'm excited about this horchata and didn't want to wait an entire year to share it with you. Besides, the holiday might have come and gone, but there is always Taco Tuesday!! When I visit my siblings in Arizona, they always introduce me to something new of the gastronomic nature. During my previous trip, Sonoran hot dogs and fresh authentic Mexican tamales were my new loves. My latest trip to Arizona was all about the horchata. This drink is slightly sweet, aromatic, and SOOOO refreshing! This beverage is popular in Spain and throughout Latin America. The Mexican version that I tried was superb. While there are different variations and different add-ins, the basic ingredients in Mexican horchata are rice, water, cinnamon, and sugar. Ground almonds are also commonly used. Authentic Mexican horchata starts with rice milk made from scratch. It is delicious with just rice milk, but other types of milk can be added for additional flavor. So far I have made horchata with almond coconut milk, and I have also made it with coconut milk (from the can). Both were equally delicious!! Horchata is my new "it" drink of the spring/summer. I am looking forward to making lots of this thirst quencher in the upcoming months. p.s. Try this with a splash of coconut rum. You'll be glad you did!! Option 1) Place rice, cinnamon, and 2 cups water in a blender or food processor. Blend until rice is broken into coarse granules, about the size of coffee grounds. Stir in the remaining water. Refrigerate for at least 3 hours, overnight is best. Option 2) Place rice and cinnamon pieces into coffee grinder, a small blender, or a small food processor. Grind until rice becomes course granules, about the size of coffee grounds. Place rice mixture into a large container. Stir in water. Refrigerate for at least 3 hours, overnight is best. The longer it sits, the more flavorful it becomes. Next, drain the rice through a fine mesh strainer lined with 3 to 4 layers of cheesecloth. Remove some rice granules from strainer if the liquid has a hard time draining. Discard solids. Place rice milk in a pitcher. Add milk of choice, vanilla, and sugar. Stir until sugar dissolves. Serve over ice. Garnish with a sprinkling of cinnamon and/or a cinnamon stick, optional. Adding milk is optional. If you prefer using just rice milk, increase the water amount to 5 cups. Use appropriate size blender or food processor for pulverizing the rice. Too large of a container will only swoosh the rice around and will not break it up. 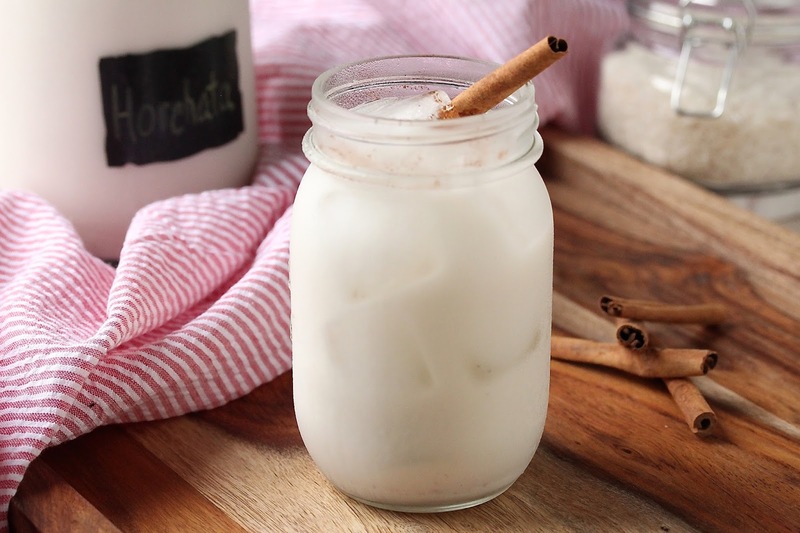 I'd never heard of horchata until my older daughter lived in Spain. But I've never had it. I love that you made it from scratch - I'm going to surprise her with it! Spain! Oh lucky her!! I'm sure she will be delighted with your surprise! Oh my gosh! I certainly hope you just get a little more rain and you don't actually fall in a pool or something. I think this is Mother Nature's way of making sure you really, REALLY enjoy the summer. Like with an extra glug of coconut rum in your horchata :). That sounds really good right now! You can't fight Mother Nature, so I'm ready for it ;) And coconut rum rocks!! this sounds so refreshing!!! i was just in arizona last week, and though it was crazy hot (97f oof), it was a lot of fun! didn't have any horchata there, and i'm kind of sad about it now. I'm glad you had fun. Yes, it was pretty hot, but I like how it cools off pretty quickly when the sun goes down. I have been out there when it hit 110 degrees! I hope you'll get to try horchata at some point! Thao, this looks like a great recipe, really refreshing and delicious. I have never tried horacha before so definitely would love to give it a try. Thanks Ashika! For me, horchata is one of those simple things that leaves a lasting impression. I hope you are having good week too! I didn't know that making horchata was so easy. I've only tried it a handful of times at Mexican restaurants and have really enjoyed it. Saving this recipe to make! It is! It was something I had to learn to make. My husband likes it so much that he makes a quick cheat version of his own using store bought rice milk. It's also fabulous! We get so much rain around here so I feel ya!! I've heard about horchata before, but have never had! Regardless if it an 'it' drink I would love to try it and love the idea of spiking with rum ;) Perfect on the back deck on a warm summer day...when summer arrives, lol! Have an awesome weekend, Thao! I hope you have a nice stretch of summery weather soon!! I plan to have a few lazy days on the deck with this drink (with rum) while blasting my 70s & 80s music. 😄 Have a great weekend, Dawn! I can see why this is your summer "it" drink. Its so good, I haven't had one in years. Now Im craving one ;-) . Great recipe. Take care. We need to o something about that! I think it's time for you to get reunited with horchata, Stacey! 😉 Have a great week!! Thank you. The cinnamon makes it wonderful! Thao--you're back! Missed your wonderful recipes so happy to see you again! I have been hearing so much about Horchata and I can even do a "local" version of this with my own local rice so I'm excited! Thank you for being so sweet, Inger!! I missed blogging. To think all these years I've missed out on horchata, but now I can have it whenever I want! Have fun making your own! I'm so glad you stopped by!! One of my favorite recipe, loved it. Thank you, Brooke. 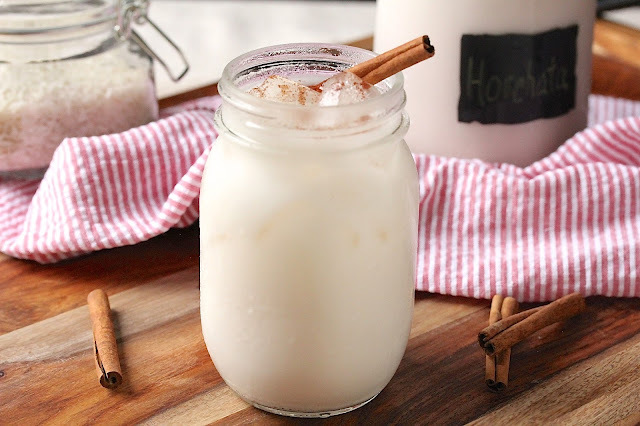 Horchata is SOOOO refreshing on a hot summer day!